The line chart is the simplest charting option. Rate history is measured according to customizable time intervals, and the points, which illustrate the closing rate at that particular time, are connected by a line. The horizontal axis lists the time units (for example: 1 minute, 15 minutes, 1 hour, 1 day, etc.) and the vertical axis illustrates the rate value. For example, the graphic below details 100 intervals of 15 minutes on the horizontal axis, for a total of 1500 minutes (25 hours). 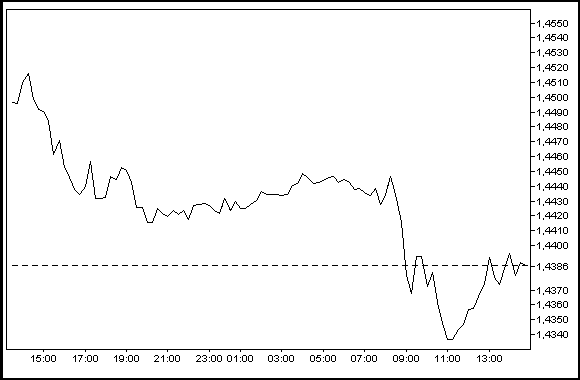 This means that the closing rates are indicated at each 15 minute interval. One of the problems with the line chart is that only the closing rate is shown for every time interval, and doesn't let us see changes that happened within this period. 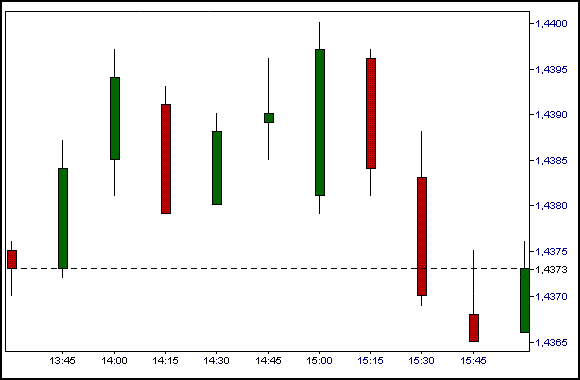 Using the OHLC bar chart, traders are able to see all price changes occurring within each time interval. 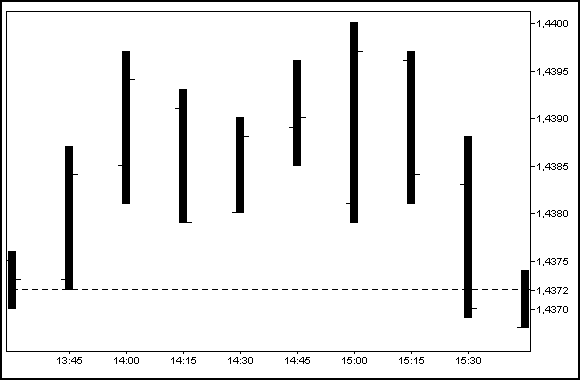 Using the OHLC bar chart, traders may identify the opening rate (O), the highest rate (H), the lowest rate (L), and the closing rate (C), within each time interval, as shown on the graphic below (note that the opening rate is on the left, while the closing rate is on the right of the bar). The candlestick chart, based on an old Japanese method, is similar to the OHLC. The body of the candle is red when the opening rate is higher than the closing rate. The body of the candle is green when the opening rate is lower than the closing rate. When the candlestick is green the top of the body, the thick center of the candlestick, represents the closing rate. When the candlestick is red the bottom of the body represents the closing rate. The two lines extending from the bottom and top of the body illustrate the high and low of each particular time interval.